Posted in Ayahuasca, Consciousness, Creativity, Culture, Dennis McKenna, Evolution, Extraterrestial, Future, Psychedelic Research, Psychedelics, Shamanism, Terence McKenna (mp3). Just listened to this podcast, i found it really enjoyable, did any one else like the Terence Mckenna like noises Dennis did sometimes? The grunting and the laughing really reminded me of his brother! First time I’ve heard a proper rap from the other McKenna brother, definitely interested in his ideas of plants domesticating humans, not considered that before. And yes, if life is a property of material then hopefully we do live in a universe populated by others, I’d love to think so anyway. 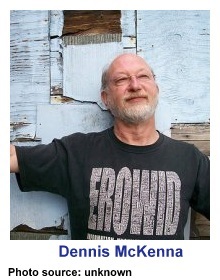 Any chance you could get some more Dennis McKenna material? Keep up the good work Lorenzo!